The race for the next Governor of Georgia has begun! Late last week, Secretary of State Brian Kemp announced that he’s running for Governor on the Republican ticket. 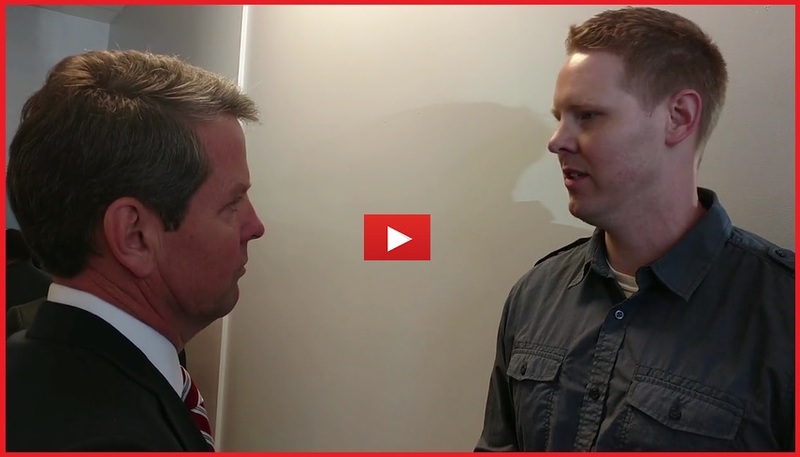 The next day, I came face-to-face with Kemp at the Cobb GOP Breakfast and asked him where he stands on Constitutional Carry (video below). In short, Kemp would not say where he stands on Constitutional Carry. For the last eight years, Governor Deal has done everything in his power to weaken, water down, and if he can, kill pro-gun legislation. That’s why in the coming months we will ask candidates for Governor to go on record on Constitutional Carry BEFORE they get into office. Please call Kemp’s press secretary Ryan Mahoney or send Kemp a Facebook message using the contact information below. Let Kemp and his campaign know you expect him to come out in full support of Constitutional Carry. After you’ve made your call or sent your Facebook message, please click on the video below to watch my exchange with Kemp, then pass this email on to family and friends. We will go any place at any time to ask the tough questions of the politicians. It may not always be the glamorous or popular thing to do, but this is the only way to hold the politicians accountable — get them on record. Please contact Kemp’s campaign today, and if you can, please continue to support Georgia Gun Owners in whatever capacity you can.